We have an interest in diversifying into real estate at some point in the future. More than a few friends and family members have gotten themselves involved one time or another as real estate investors, so there’s quite a pool of experience there to draw and hear from in case we ever get serious about it. I’d say majority of those involved in these real estate endeavors have been saying the same thing thus far — that this is not yet the time to buy property or get into real estate just yet. It’s potentially going to be a long wait before the market starts to turn around: I received some predictions from my more experienced investor friends and they say the earliest that they’d start even looking at the market for purchase is sometime in 2009, but it really all depends on how things pan out. If this housing cycle is actually going to last the typical length as history has shown, we could be waiting 3 to 5 years (longer than that is not out of the question) to reach the bottom of a market cycle and another 3 to 5 years to recover. Looks like housing market cycles are stretched out much longer than any stock market cycle I’ve seen. Not to mention that there’s already discussion that this subprime lending crisis will turn out worse and much more costly than the S & L crisis of years past. 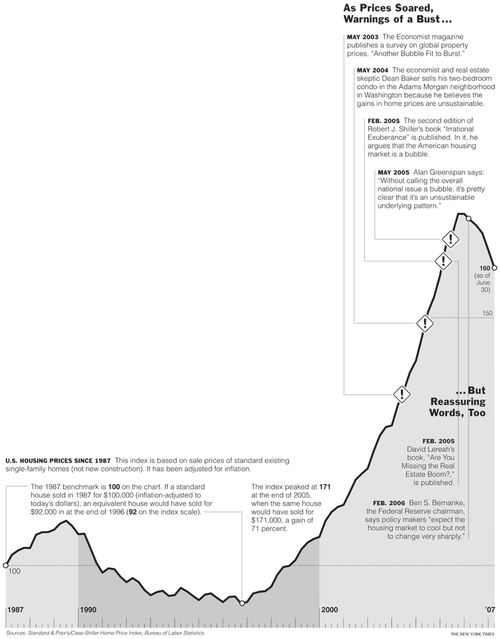 As an illustration, I found this historical chart depicting the national housing market, where I zoomed in on the market cycle of the 1990’s. The shaded regions show you the length of the cycle that lasted then, and puts into perspective how long the malaise can last. This particular cycle bottomed out 7 years after the downtrend started. SEVEN years to the bottom and another THREE years to get back to where it was in 1990. Click on the image below for the even bigger picture. 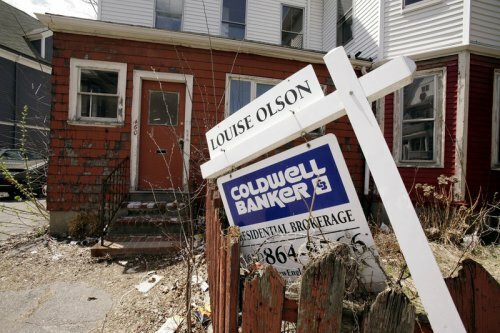 Sure, those foreclosures and higher inventory of listed homes are tempting to check out right now. If you’re after a home to live in, you won’t go wrong starting your hunt now because you could find the home of your dreams anytime. There are many other factors beyond the cost when you’re buying a primary residence. But an investment property is a different animal to evaluate. I’ve been advised before that just as long as you’re a long term investor, you shouldn’t mind how the market’s doing when you buy in. I’d argue that this is true about stock market investing — I’m not quite convinced that investing at the peak of the housing bubble is a good idea no matter how you look at it. Doing so can test your commitment to the investing process when you realize your investment is pretty much dead money for a significant period of time. Once you buy a property, your profit is locked in: you’ve made or lost your money at the time of purchase. Another decision that could make or break your bank rides on what location or neighborhood you’ve decided to buy into. Here’s where your research should pay off — carefully consider places of good employment, development and decent growth. Where’s the demand for properties? Also, consider the issue of states that have homestead exemptions, where investment properties are known not to appreciate as quickly as in other areas. Who should manage the property? Are you going to be the landlord or is someone else doing it? That could spell additional expenses if you pay someone else to manage your tenants and rentals. But if you’re buying outside of your own neighborhood, you may find that hiring a property manager is the only choice you have. Investing this way is a big commitment and if I enter into this, I’d work to understand all the risks involved and perform a significant amount of due diligence before making a transaction. Especially since I’ve never done this before, I’d be doing a lot of research, readings, probably even attend seminars and evaluate all options before moving forward. Unfortunately, planning has not been the strong point for a lot of would-be investors, given how enticing the hot market of recent years turned out to be. Don’t get emotional nor attached. As a househunter looking for a home to live in, it’s but natural to feel emotionally attached to a house that calls your name. But as an investor, you’ll need to check your feelings out of the process. You may not be optimizing your investment if your emotions get in the way. Know the basics and the math. How much do you like math? Investing in real estate the traditional way involves transactions, money, number crunching. The only way to know if you’re going to be making money is to be familiar with a variety of calculations on the subject. Without this knowledge, you’re just flying blind. Invest for the right reasons. Are you cut out to be a landlord, a rehabber, a flipper? Think about what kind of role you’d like to take when entering into this realm of investing — will you be actively involved in property management or just be a passive investor? Also, you may convince yourself that this is something to get into because “everyone else is doing it” (herd mentality). Or because you’re looking for a tax shelter (max your retirement funds, it’s easier). Or because you want to feel the joy and power of “owning something”. Some of these feelings do fade away with time but your money commitment will remain, so be prepared to ride the waves of this market. Her property was located in a homestead state. Property bought sight unseen (except via photos) and through an online realtor who supplied information via email. The existing long term tenant is paying below market rental rates: my friend claims she’ll hike the rent in a month’s time. Rushed decision-making: my friend was concerned that if she didn’t act now, she may lose motivation to do this later. Main reason given for the investment: tax benefits. Prospect of owning the property was clearly an exciting event for my friend. She couldn’t wait to say she now owned something tangible as a full-fledged investor/property owner/landlady. Somehow, I could not shake my concern over the level of due diligence applied to this purchase. I can only wish her luck with the moves she’s made. I’m not going to say she’s made mistakes here — after all, I’m not an experienced investor in this arena myself — all I could tell her was that my intuition told me to avoid this deal. 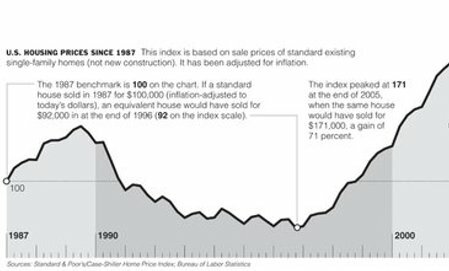 As for us, we’re biding our time way into the latter half of 2009 before doing much more than to read up on how this housing market is turning out to be such a bummer. Very helpful post as I’m also looking at investing in real estate. Since I couldn’t tell when is the market going to hit bottom, I’m going to wait until the prices starts climbing up again. Unless a super awesome deal comes along. Real estate both scares me and excites me at the same time. It is a huge investment from both a financial sense and, oddly, from an emotional sense. When you’re providing a home for a family to live in, I think I might have a difficult time collecting from a family that fell on hard times from losing a job or even the death of a family member. I just think it would be a different type of investing that looks one way on paper (and late night infomercials) but in actuality is much more demanding and exhausting than anyone is willing to admit. I know several people that own “rent houses.” They are wonderful, great people, but I can tell that when it comes to their real estate, they take a hard stance on late payments. They have to. I think I would much rather buy, fix, and sell than rent. At least my commitment would be limited to the house, rather than a family. the fun will start right at the beginning. She will hike the rent and the tenant will bounce. Thus begins the panic and doubt. what she does with the problems is what determines if she is cut out for it. I think you made a good point about market timing. Real estate seems to me to be completely different from stocks as far as buying in. You can’t dollar cost average a house. Nor can you buy them in indexes. The biggest issue is finding the bottom. The important part is to find a fair value and invest for the long term. Remeber those houses in Orange County were designed to be for returning GI’s and to be sold for less than $5000. Sounds like your friend was set in her ways. Thanks for the tips. If I had extra money I’d definitely buy soon and hold. It’s a good time to find great deals but if you can’t afford to spend some money and wait awhile to make some … it’s definitely a good time to wait. If you are itching to get into real estate at anytime, not just in a bad market, I strongly suggest considering REITs. There are many types of REITs (residential, commercial, storage, hotels, etc.). You can also own the REIT index, Vanguard has one, ticker VGSIX. It absolutely follows the market and grew like crazy for many years and tanked last year. You can then dollar cost average into them and I would suggest doing that now. Even it takes 3 years to fully recover you will not have bought at the peak (like you might if you buy a single house all in one shot). REITs tend to throw off a lot of income (hint taxes). I have a couple posts on my blog concerning real estate (shameless plug). There are many other advantages to REITS, a) you are not a landlord, b) no emotional attachment, c) you can clearly see your ROI, d) diversification. Quite often the meager rental income generated off a large purchase like a single family home doesn’t compare with a simple equity investment, when costs are taken into account. If you believe in diversification, and you should, then REITs are much better for you. I think it’s worthwhile noting here that real estate investing does NOT have to be limited just to houses. It also includes commercial real estate. Most people assume that commercial is too hard (or expensive) for beginners to get into, but I’ve been reading an interesting new blog recently () that has got me considering it. It still seems daunting, but he does make some good cases for why we should at least consider investing in commercial real estate. These are all helpful hints for first time buyers, but your list that fell off deaf ears shouldn’t mention the fact that she bought it from an online site. The mistake your friend made was when she chose the site. Why not check other sites like neighborcity.com. Their model centers around finding the best real estate agent for each client, based on statistics and past client ratings. Whom you choose as your agent will most likely define your home buying experience, and this should be number one on any buyers’ list. Not a bad list. If you are dealing in SFR’s (single family residences) I would also suggest understanding what you are buying. The landscape is littered with first time investors who bought something that required major repairs that weren’t planned for in their financial model. The typical housing inspector just can’t find everything in a couple hour inspection. Rule #1 in Buying Anything – Why Are They Selling? The tips you have explained are great. I am very impressed with the point “Don’t get emotional nor attached”, This is the reason sometimes owners dont sell their home, but they get a very good value of their homes. Great tips for a newbie.. When it comes to reliable investments, real estate investing is the best wealth-builder in the world. Practice it effectively. To me you should be able to invest in real estate during any type of market, down or up. It’s all how you purchase price and make sure you only do deals that work for you. The key is not to be a motivated buyer and just take your time and have a plan. This is such a true post. So many people think they can buy a real estate book for $19.95 and become a real estate millionaire. It takes a lot more wisdom than just following 12 steps to success or something. The most important thing before getting started in real estate is research and advice. There are so many pitfalls that it’s almost impossible NOT to make a mistake. Very good topic to get out there. I recommend joining a local real estate club / associations.